Pisces July 2016 Horoscope foretells that people born under the sign of the Fish will have to concentrate on their emotional strength and domestic issues. This is the time to form a powerful base for launching your career goals. Family issues will be delicate and time consuming. Presence of Venus will enable you to refurbish your home environment with beautiful pieces of art and paintings. Majority of the planets for the Pisces zodiac sign are in the Western half of the chart towards your rising sign. You have to use your social skills and grace to achieve your life targets. Independence and determination will not yield results. Interest of other people will dominate over self-interest. You have to bend yourself to the wishes of others. Most of the planets are retrograde this month in July 2016 for the Pisceans and you have to accept the delays and wait for good days to come. The July 2016 monthly predictions suggest that professionally things are becoming clearer and have started their forward course. You have to divide your time between hard work and enjoyment of life. If you are looking for a job, you will find it in social circles or while partying. You have to be resourceful if you have to be employed or improve your business. Financial situation for the Pisceans is robust this month in July 2016. Earnings can be expected from career or while chasing your fitness aspirations. After that, cash will flow with the active support of business dealings, social network or through your love mate. If you help others prosper, your wealth automatically improve. You should focus on earning money by ethical means. You can heed to the suggestions of your associates to make more money. The 2016 July Pisces astrology forecasts show that love will be much better this month. There will be many romantic opportunities for the singles due to the influence of Mercury. Love is to be found while socializing or in dating in the gym. Your workplace might also be the source of romance. Relationships will be more committed towards the end of the month and may culminate in marriage. Existing relationships are subject to conflicts especially when it comes to sexual compatibility. Pregnancy related questions might arise in your mind. 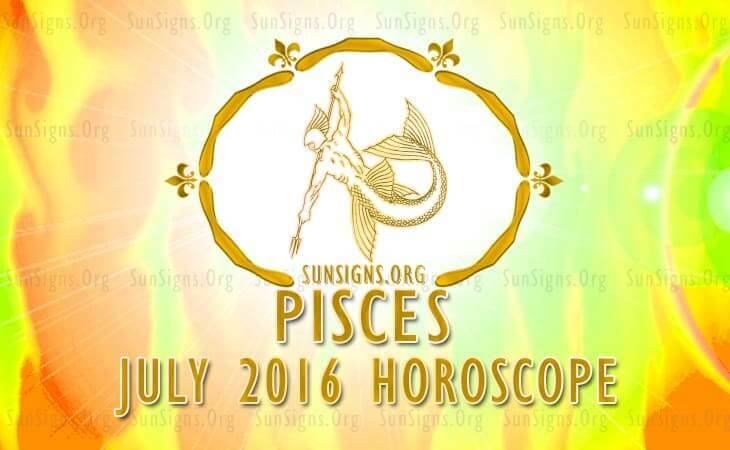 Health will be excellent this month in July 2016 for the Pisces. You will be paying more attention to your food. Fitness and healthy foods yogurt, banana, walnuts like will be of importance to you and this itself will enhance your health enormously. Emotional health will be important in addition to physical well-being. To conclude, the July horoscope 2016 for Pisces asks you to plan well when it comes to career and enjoy the love affairs and flings that come your way.